Family Double Room with Bunk and sea views. Double room + 2 Single bed. Sea-view accommodation right on the beach at Muizenberg’s Surfers Corner… with a surf-centric cafe bristling with positive energy… surf lessons, yoga, healthy food and great coffee… a meeting place for like-minded souls in a beautiful setting. With access to Wi-Fi all over, African Soul Surfer has two massive floors - one of which is dedicated to beds & accommodations, the other, for social & other activities, this includes a restaurant that provides meals on request & includes facilities for self-catering. In addition, guests get to enjoy large comfortable lounges for relaxing in, a balcony to chill on with epic impressive views, a pool room with table tennis, a yoga studio & a media entertainment lounge. 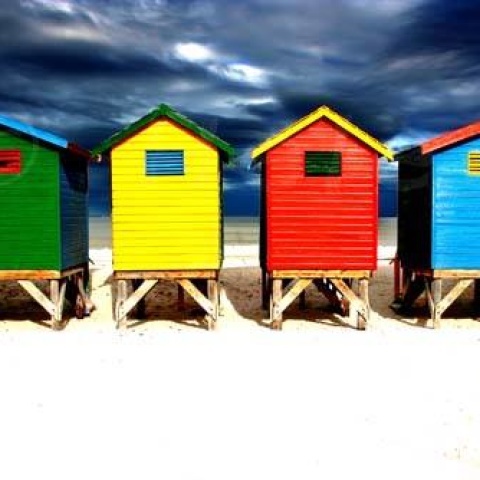 Muizenberg is the gateway to the South Peninsula and its many great attractions like Kalk Bay, Penguins at Boulders, Cape Point and much natural beauty to explore. Locally plenty of nice restaurants, art galleries, markets and adventure activities. We have one of the best beaches in the world for Learning to Surf! Packages available that include accommodation, meals and daily surf lessons. We have a large selection of room types, most with stunning sea views, to suit any group size/budget.